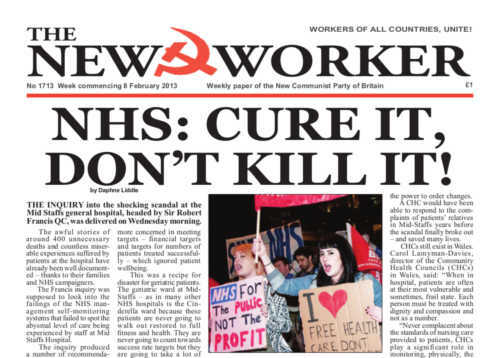 NHS: Cure it, don’t kill it! THE INQUIRY into the shocking scandal at the Mid Staffs general hospital, headed by Sir Robert Francis QC, was delivered on Wednesday morning. The awful stories of around 400 unnecessary deaths and countless miserable experiences suffered by patients at the hospital have already been well documented — thanks to their families and NHS campaigners. WHAT WILL they think of next? The leaders of the Con-Dem Coalition are very creative; forever coming up with new ideas to make poor people more and more miserable. Two years ago it was the massive cuts in public spending that closed down local services that made people’s lives a little better and at the same time threw thousands of people who worked in those services on the dole.